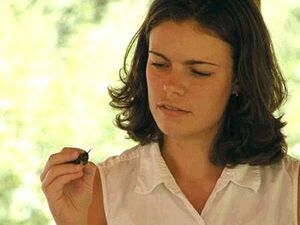 In 2005, informative and entertaining hummingbird banding presentations are already scheduled for Virginia, Maryland, South Carolina & Kentucky/Tennessee. If your group would like to host "Hummingbird Mornings" anywhere in the U.S. or Canada in 2005 or later, see below and contact Bill Hilton Jr.
Bill Hilton Jr., executive director of Hilton Pond Center for Piedmont Natural History, is one of only about 100 active scientists in the world authorized to capture and band Ruby-throated Hummingbirds (Archilochus colubris). 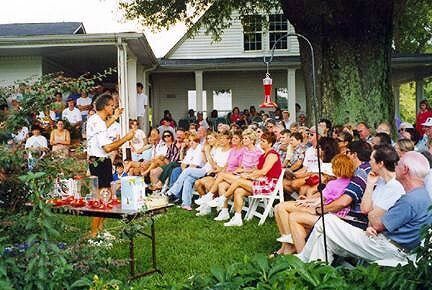 Each summer, his famous Hummingbird Mornings presentations delight thousands of hummingbird enthusiasts around the country. Find out how to attract these amazing feathered dynamos to your yard and then get up close and personal with hummers as Bill captures and bands them. You don't want to miss this chance to learn from a nationally known expert and exceptionally entertaining and informative lecturer. Satisfaction guaranteed! In the elegant words of one audience member who saw Bill's 2003 presentation in Virginia, "I cannot remember the last time I so thoroughly enjoyed a seminar as yours today in Fredericksburg." Hummingbird Mornings weekends may include banding demonstrations, slide lectures, teacher workshops, student programs, activities for senior citizens, or any combination thereof--including training in the exciting new GLOBE/Operation RubyThroat hummingbird observation protocols. Admission fees vary with the site and door prizes may be awarded. All proceeds go to support the work of Hilton Pond Center and other non-profit organizations hosting the events. Contact Bill Hilton Jr. for an opportunity to host Hummingbird Mornings and generate great publicity & revenue for your own organization. If you can't attend a "Hummingbird Morning" program, Operation RubyThroat T-shirts are available by mail for $15 (plus $5 shipping); proceeds support hummingbird research & education. Hummingbird games and crafts for kids; information booth on hummingbird gardening, feeder care, and hummingbird biology; shade grown coffee tastings, interactive displays; hummingbird photography booth; interpretive programs on native Kentucky wildife; and more! Admission Fee: $3 children/$5 adults for one day; $4 children/$6 adults for both days; $3 for seminar only; $6 package for the entire weekend. 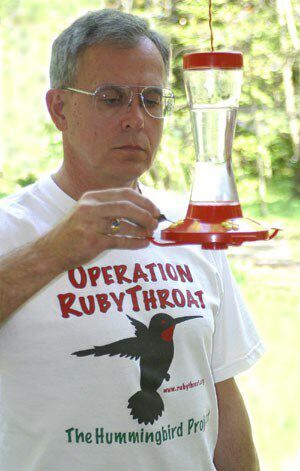 Operation RubyThroat T-shirts will be available for $15; proceeds support hummingbird research & education. On Friday (8:30 am-2:30 pm), a special GLOBE/Operation RubyThroat training workshop will be offered for adults--such as birders, gardeners, and especially K-12 teachers--interested in learning how to collect and report observations about Ruby-throated Hummingbird behavior. The workshop will include information on developing a Schoolyard or Backyard Hummingbird Habitat. A $10 fee includes materials, lunch, and Friday admission to the nature station; advance registration is required by contacting Cindy Earls via E-mail or phone (270-924-2020). From Nashville: Take I-24 N to Cadiz KY exit; go west on US68/KY80 for 10 miles to Land Between the Lakes; turn off onto road called the Trace and go north; Woodlands Nature Station is 12 miles. From St. Louis MO and Paducah KY: Take I-24 S to Grand Rivers KY exit; go south about 18 miles to turn off to Woodlands Nature Station on left. Free admission to programs; advance registration requested by picking up coupon at store. Participants are also invited to visit the store before or after the program(s). Native and cultivated plants, hummingbird feeders, and other items available for sale at the presentations. From I-95 take exit 130B West (Plank Road). Go past Central Park shopping center (there is a huge sign) and turn right on Bragg Road. Continue on Bragg Road, which becomes Fall Hill Avenue. Stay on Fall Hill Avenue, which goes back over I-95 down a long hill. At the bottom of the hill the Rappahannock River is on the left. Make the first left turn onto Caroline Street. Follow Caroline Street until you see "Old Mill Park" on the left. From I-95 take exit 130B West (Plank Road). Go past Central Park shopping center (there is a huge sign); store is on the right 1.5 miles west of I-95. Store has a green metal roof, long front porch, and fountains out front; parking in the rear. Free admission to the nature preserve but pre-registration is required; adults-only workshop fee is $18 ($15 FOBH). Workshop participants will be fully certified to make observations and submit data through Operation RubyThroat/GLOBE, and will receive six hummingbird plants to take home. Light refreshments provided; bring your own water and bag supper. From North - Take I-270 to exit 18, Rte 121 (Clarksburg Rd.) and take 121 southwest toward Boyds. Drive 1.5 miles to West Old Baltimore Rd. (there will be a sign to the park). Take a sharp left onto West Old Baltimore Rd. (The turn is on a curve; exercise caution.) Continue for 1 mile to the Park entrance on your right. Follow Lake Ridge Drive 1.8 miles to the Visitor Center, on your right. From South - Take I-270 to exit 16, Father Hurley Blvd. Go east to Route 355 and turn left. Go 1 mile and turn left onto West Old Baltimore Road. Follow to Park entrance on left. Free admission to the nature preserve. ParkPASS pre-registration is requested but not required (phone and link above); walk-ons welcome. All ages. Program goes, rain or shine. For fair weather, meet at Pavilion C, near the playground on Lake Ridge Road in Black Hill Regional Park. For rainy weather, meet at Black Hill Visitor Center, 20926 Lake Ridge Drive, Boyds MD. Participants are invited to visit the Wild Bird Center store in Gathersburg MD after the second program (directions below). Free admission to the nature preserve if you mention you're attending "Hummingbird Mornings"; participants are invited to visit the store before or after the program and to make use of a special discount coupon. From I-77 (either north or south) take Exit 85, turning west onto SC 160 (Steele Creek Road). After about three miles on SC 160, look for Crossroads Plaza shopping center on the right.